When a beloved pet dies, you may want to memorialize and honor them with a unique and special pet urn to store the cremated remains. A pet that was loved and cherished deserves a special resting place. 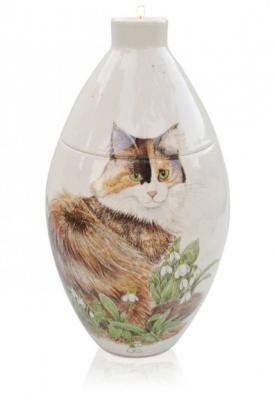 Legend Urn offers an extensive selection of pet urns that includes a collection of high-quality urns that are made from various materials such as bronze, copper, brass, stainless steel, wood, porcelain, and ceramic. The urns in the collection are handmade, have unique and beautiful designs and have a flawless finish. The various styles and unique options available are a must see. They range in price from $119 for a basic urn to nearly $1,500 for their beautiful, hand-painted urns. Foreverance.com will work directly with you to create and custom-design your pet's personalized urn so that it will exhibit your pet's personality and special qualities. Foreverance.com uses skilled craftsmanship and their experience in 3D printing to create this unique way of customizing cremation urns. This is truly an amazing process and a wonderful way to pay tribute and honor your beloved companion. If you want more information or an estimate for the cost of a customized urn, you can contact them through their website. 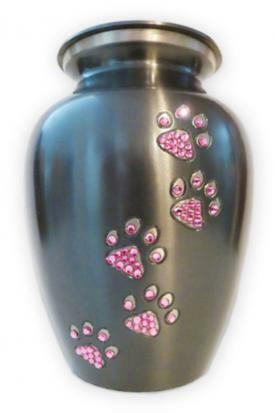 Une Belle Vie Memorial Urns offers pet urns that are artistic, creative and beautiful. Many of their urns are created by hand and include unique designs such as a brushed gold bone urn, Swarovski crystal embellished urns, and even a resin, hand painted tennis ball in honor of the dog that loved to play fetch. There are a nice variety of urns to choose from and they range in price from $45 to $1,450. Rays of Joy designs beautiful, personalized, stained glass containers for your pet's ashes. There is a large selection of styles and sizes to choose from. Some styles include a placeholder for a picture and a candle on top of the container. Each urn is handcrafted according to your wishes. They range in price from $107 to $201. Angel Ashes offers beautifully crafted urns made of wood. You can choose a crafted cat or dog for the top of the urn. 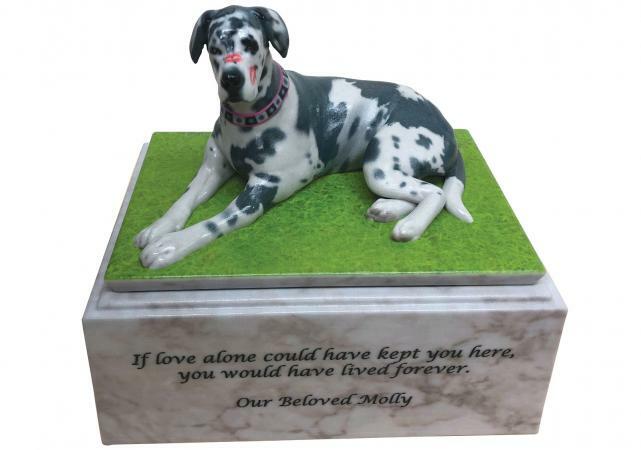 Some of the urns have a photo frame attached and the option to engrave your pet's name below the picture. Angel Ashes also has a rosewood veneer memory box where your pet's mementos can be stored. 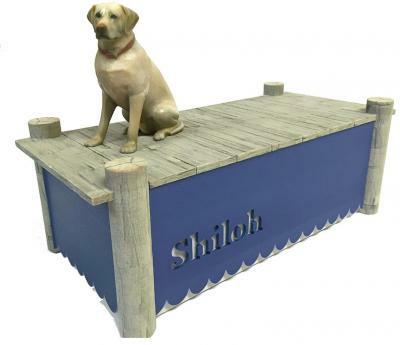 This is an ideal place to keep your pet's leash, collar or a favorite toy that you simply can't part with. 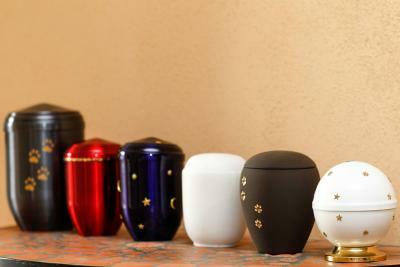 The price for the urns ranges from $72 to $155. What Is a Pet Urn? 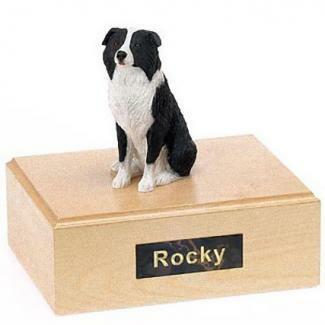 Pet urns, like urns for humans, are containers to place the cremated remains or ashes of a pet. Pets are part of the family and when they die, everyone mourns the absence of their loyal, faithful companion. 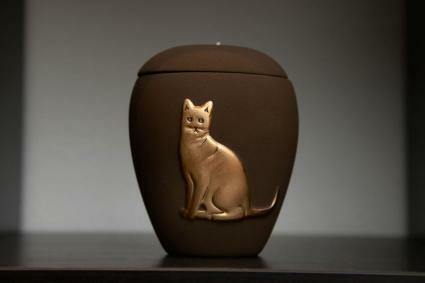 An urn that holds your pet's cremated remains can be stored anywhere you choose in your home. Some like to display the container in a spot that is visible by all, perhaps the mantel over the fireplace or on a bookshelf in the living room. 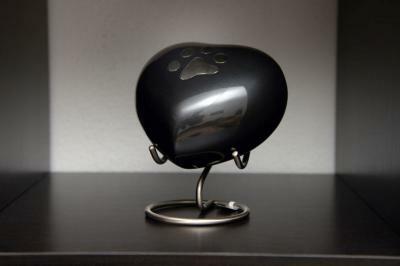 Others may keep the urn in a private location that is more discrete such as a bedroom or an office. The choice is up to you. As far as guidelines for grief go, you should do what makes you feel the most comfortable. You may wish to bury your pet's remains in the ground and place a marker or headstone at the location, just as one does when you bury a pet casket. Before you purchase the urn, it is always best to ask the company which urns are made specifically to be buried underground. When a beloved family companion dies, it is a genuine loss and there will be grieving. There also may be feelings of remorse, anger or guilt. Children will need time to process the death and it will benefit them to talk about the loss. Share your own sorrow and sadness so they will know that it is natural to miss and mourn their pet. You may even want to include them in choosing the special urn for their pet. Getting them involved with any memorial service, burial or other events surrounding the death will help them better deal with their own feelings. If you are keeping your pet's urn in the house, make sure your children understand what it is and be ready for any questions they might have.